Every year, Hindus throughout Sri Lanka join communities around the world in celebrating the nine-day Navarathri festival. 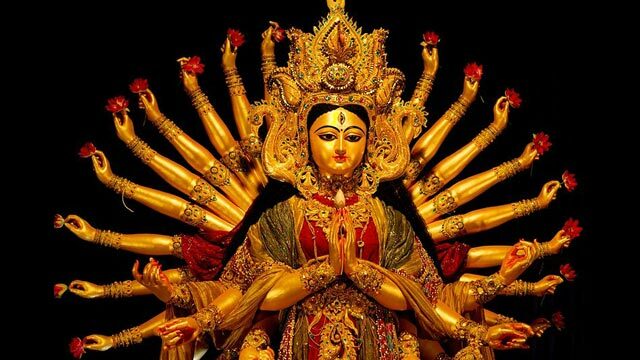 To commemorate the nine days and nights that Goddess Durga fought the Asura, she is worshipped in all her innumerable forms, signifying the triumph of good, piety and devotion over evil. Also referred to as Dasara, prayers are held for first three nights for Goddess Thurgai (bravery), second three nights for Goddess Lakshmi (wealth) and the final three nights for Goddess Saraswathy (education). In temples throughout the world, including the Veera Pathirakaali Amman Temple in Rajagiriya, Goddess Durga's blessings are invoked. At home, a doll exhibition calledkolu is arranged. Ladies visit each other's homes to see the kolu, bearing sweets, savory items and other gifts.